Once again I must apologize for being away for so long, but I have been working on the SDF-1! Unfortunately I just have not been taking photos as I should have been for this blog. I have been reworking/rebuilding a lot of SDF-1’s sections, trying to get it to look as much as possible like the real SDF-1. I have come a long way in the build since my last post, but I still have a long way to go. Sorry I have been away for so long, but real adult life often gets in the way and can keep even the best of us away from building with LEGO. Fortunately for me I have had a lot free time the past couple of days so I could dedicate time to making some progress on building my LEGO SDF-1. I’ve only had a limited amount of time to work on building the SDF-1 due to my real life responsibilities, and unfortunately extra time will only become more and more limited going forward. Since the last time I posted I’ve been dealing with a number of weight issues – even beyond the legs. 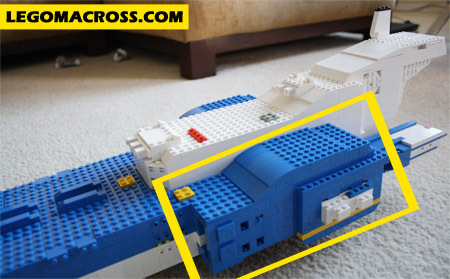 With the size and weight of this model, the traditional LEGO connections aren’t doing the trick. In cruiser mode, the blue sections on the left and right side shown in the picture below were not being held tightly connected to the main white center section with just a couple of technique pin assemblies. This was especially troubling since this was happening before I attached the legs and before I have even built and attached the carriers – which would add even more weight. 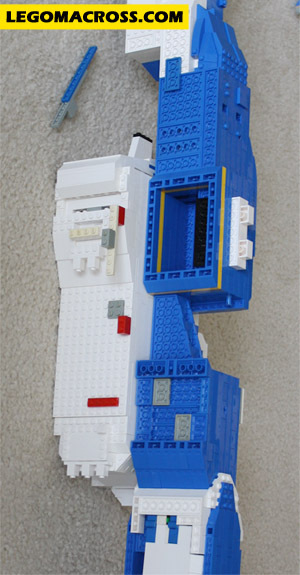 I tried to remedy the situation with numerous additional pin and axle connections which all improved the quality of the connection between the white and blue sections but none were able to make the connections really ‘tight.’ The best solution was to build a 1×1 hole on both sides of the white center section which I was able to line up with the top of the blue sections. Through this hole I slid a plate that I was able to use to connect the sections and create a tight connection. I’ve also rebuilt a significant portion of the leg to improve it and have started building the second leg. I’ve have come to the realization that glue is the only solution to make the model strong enough to support the legs. I’ll most likely need some form of super glue, because the legs are extremely heavy and there is not LEGO trick I can think of that I can use to connect he legs to the ship AND still have the SDF-1 be able to transform. 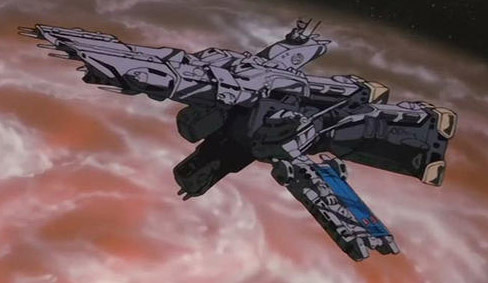 I was most afraid that the SDF-1 would tip backwards because of the weight of the Main Guns, but fortunately no issues. The only issue I found with this test was with the technique I’m using to attach the Main Guns is not really holding the guns upright and tightly to the ship. I may have to go back to the drawing board on that feature. I have to order a ton of new bricks on Bricklink in order to finish the 2nd leg. If the gluing the LEGOs together does not work in providing enough support for the legs then I’m not sure if I’ll be able to continue the model, at least not at this large size. I’m going to hope that all the time, energy and money I put into this model will not go to waste because of that. The photo below is of a test to see what the SDF-1 would look like after transformation, I’m attempting to line the blue section up correctly. The line art images that I have are not too much help because they are not really drawn to scale, especially after transformation. Because the artwork is untrustworthy, I had to use my own best judgment to decide how far out the white section should protrude after transformation. This is the most detailed image I have of the SDF-1 in attack mode but the I use it the least because so many areas of the drawing is not to scale. This week I’ll have less time to spend on this, I have to get back to real life! 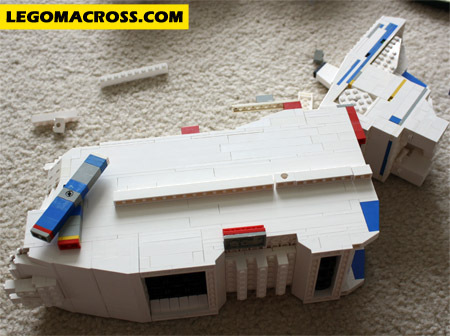 Also, progress is limited until I receive my new LEGO orders from Bricklink. Best case I hope to at least finish the leg by the weekend.